Are you ready to have your best financial year ever? A year where you look back and see noticeable changes to your financial status: an increased bank account balance, reduced debt, and growth in your investments? There is no better time than 2018 to achieve your best year ever! Step #1 Identify your current status. Here at I Was Broke. Now I’m Not., we identify three different financial status points: STRUGGLING, STABLE, or SURPLUS. Most people can readily identify their current status. This allows you to clearly determine your next steps. Step #2 Identify your next rung on the I Was Broke. Now I’m Not. Ladder. 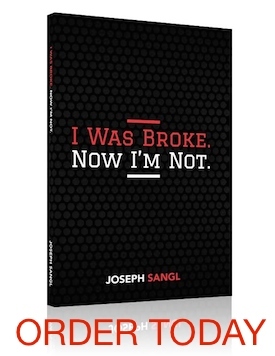 Once you’ve identified your current status, it is helpful to look at the I Was Broke. Now I’m Not. Ladder (pictured above) to determine your next step. Below is some general guidance for each financial status. You would eliminate all non-house, non-business debt! No student loan debt. No credit card debt. No furniture loans. All of your vehicles would be paid off. You wouldn’t owe any family members or friends. Your savings account will have grown substantially which provides you with incredible margin to focus on the things that matter most! You would have 30-percent of your gross income in investments which positions your money to earn more money for you – a secret all wealthy people have discovered. You would have zero house payment. None. Zero. Nada. Step #3 Set five key financial goals for the year. Rarely does anyone accomplish anything great without first making it their goal. INCOME GOAL Be sure to think outside of your normal income source(s). What are some alternative ways to produce more income this year? GIVING GOAL What are the causes you want to support financially throughout the year? SAVING GOAL What are the things you are saving for? Consider your dreams, both short- and long-term. What are some expenses you could eliminate from your life that would allow you to boost your savings? INVESTING GOAL This is money that is positioned to grow. There might be some risk required (think stock market), but it provides you the opportunity to beat inflation and grow your money to a level such that big-time dreams become possible. Dreams like retirement, paying for college educations, and that big trip around the world! DEBT ELIMINATION GOAL Take a moment to document all of your debts. Which ones would you like to eliminate before the next year ends? We prepared a handy DOWNLOAD for you to use to document your goals. Step #4 Establish accountability. No matter the passion in which we pursue our goals, we are all susceptible to falter along the way. Share your goals with someone, but don’t just share with anyone! Share it with someone who shares similar goals and has already achieved many of the same goals you are pursuing. Step #5 Increase your financial education. We have all heard the famous statement: “If you keep doing what you’ve always done, you’ll keep getting what you’ve always gotten.” The same is true with your financial future. It will require an investment from you – and in you! Read some financial books. Attend a financial conference or two. Hire a financial coach. I’ve never heard anyone say that they regretted investing in their financial education! You are positioning yourself to prosper. Congrats! Let’s have an amazing 2018. Thank you for this! I like going back (quite aways) to your blog posts on vision for inspiration.